CookStop has solutions for special situations. The Smart Socket may be installed to discourage tampering or attempts to bypass the CookStop control functions (e.g. in student housing). This smart socket is designed to replace the standard 3-wire socket normally found behind a stove in a building built before 1993. 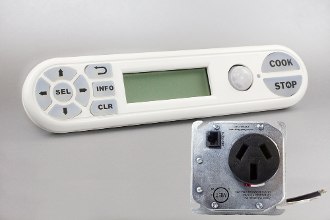 This smart socket has all the features of the 3-wire plug in power unit in the CSA-3WP-IRF kit.